Cooking for yourself and others can be a way to find joy and inspiration and is a great goal as we move into the second month of the new year. This chunky, hearty chili is a great dish for days when you are getting a group of friends together and is also just the right warmer for dinner on a cold winter night. The inspiration for this recipe comes from a Cooking Light magazine recipe that is many, many years old. 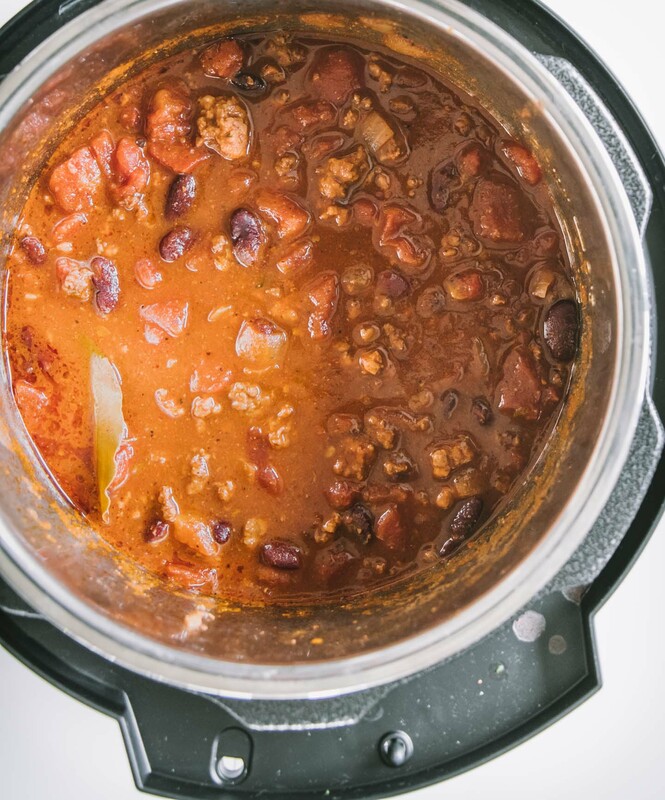 While I still sometimes make something close to the original stovetop version I’ve adopted it for an Instant Pot because it’s a great way to make chili that mostly involves hands-off cooking time! 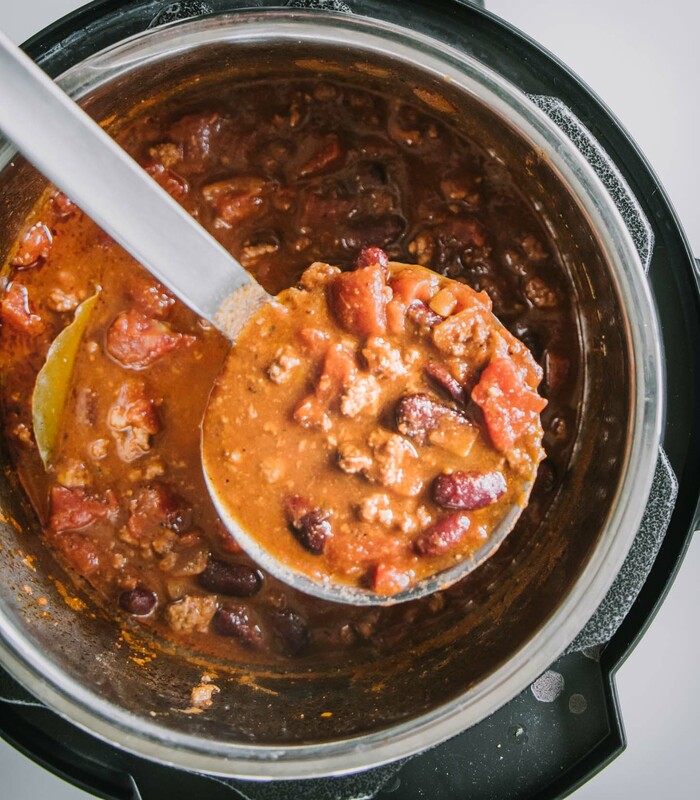 By making chili in an electric pressure cooker you not only speeds up the cooking process but also gives you an extra boost of flavor. Making chili in an instant pot is really easy because there’s an actual setting for chili and beans. This means that other than browning the meat there is not much you need to do other than add the rest of the ingredients and let your pressure cooker do its thing. You’ll start by pressing the sauté button then once you can feel the heat, add the oil to the instant pot liner. Add the pork first. Since it has more fat this will help to ensure your ground beef doesn’t stick to the bottom of the pot. Once the pork has cooked for a minute or so, grab your ground beef and add it as well. Use a non-metal spoon to stir and crumble the ground beef. You want nice small pieces in your chili. Normally you’d want to use a less lean ground beef, like 80% lean, in chili to give you extra flavor but in this case, you get that flavor from the ground pork and from pressure cooking the chili so using 90% lean ground beef means you won’t have to drain the fat after cooking the beef. Once the beef is cooked through add the onions, garlic and green pepper and quickly sauté them as well. Then you’ll add the wine and deglaze the pot by using your spoon to scrape any stuck-on bits off the bottom of the pan. Then in go the rest of the ingredients. Use the chili/beans setting to cook for 20 minutes. This should automatically give you high pressure. Once the chili is done cooking let the pressure release naturally for 20 minutes. The first time I tested this chili in my Instant Pot was the first time I’d ever gotten the dreaded Burn notice on my Instant Pot. I had to do a little research to learn more, so here’s the scoop. The burn noticed is generally caused by something at the bottom of the liner burning or getting too warm. When you sauté the beef you may end up with little bits stuck to the pot, causing the pot to think something is burning. To start, always make sure your liner is really clean. If you have food stuck on the bottom from a previous use you are much more likely to get a burn notice. I use a little bit of baking soda to remove any stubborn, stuck on bits. Be sure you use oil and add the pork to the pot first. This will help to keep anything from sticking. The deglazing step is also key. If you scrape the bottom of the liner well after you add the wine it will help prevent anything from sticking. Hit cancel to turn the pot completely off. Manually release the pressure, being careful not to place your hand directly over the valve. Let the pot depressurize. Once the pot has depressurized open the lid and use a silicone spatula to stir the chili and scrape off anything that is stuck to the bottom of the pot. Start the cooking process again. You can guestimate how long the chili had been cooking at set the time accordingly. If you cook it a little longer than 20 minutes don’t worry, the longer it cooks the more flavorful it will get. If you continue to get a burn notice you may need to dump the chili out of the pot and fully clean the liner. If this happens, I recommend cooking it the rest of the way on the stovetop, unless of course, you have a second liner, which is on my list of things to buy! If you are really concerned about a burn notice or have had issues in the past you can always brown the meat on the stovetop and then add it to the instant pot with the rest of the ingredients. I’ve only gotten the burn notice one time and I’ve made this and other chilis in the instant pot successfully many times since then! Since there is no dairy involved, chili is really easy to freeze. Cool your chili completely and store in either Ziploc bags or a freezer safe container. If you use Ziplocs be sure that you press all the air out of the bags to avoid freezer burn. To reheat I usually defrost the chili in the refrigerator first then either add it to a pot on the stovetop or microwave it to heat it up. 3 Quart Instant Pot – Since I mostly cook for one or two I’m a big fan of this smaller sized Instant Pot. Just about any recipe will work in this or can be adapted if it needs little less liquid. Due to it’s smaller scale it’s easy to store too. Silicone spatula – These are really a kitchen necessity. They are heat resistant which means they work when cooking in a hot pan and the silicone ensures you don’t need to worry about scratching. I have about a half dozen of them in my kitchen. Instant Pot Liner – This is great if you want to do a couple of different recipes during your weekly meal prep. It means you don’t have to stop and wash after the first one before you start the second. I recommend it for any kitchen that has an Instant Pot! I ordered one while I was writing this post!! I don’t have an Instant Pot, but I do have a pressure cooker. I know I can adapt it for sure. However, my daughter DOES have an Instant Pot. They love chili. I will be sure to pass this recipe along to her. I loooove chili! Especially made in my instant pot. I can’t wait to make this version, it looks absolutely delicious! This is exactly what I need right now! It looks and sounds so warming and comforting and would be perfect for these cold winter days. That chunky texture looks incredible! Love all the ingredients and spices there too, and just looking at the pictures makes me wanna grab a spoon and dig in! I’ve been trying to use my InstaPot more. Recipes like this make me more than happy to do so. This delicious chili is the perfect dinner during these cold winter months. Thanks for posting! I don’t have an Instant Pot but I’m sure I can adapt the recipe with what I do have. I love the ingredients you’re using for the beef chili. I bet it does make an amazing stew. Very flavorful and satisfying. Marisa – It definitely works on the stovetop too. About 90 minutes or so to simmer, more if you’ve got the time! This looks so yummy! I love the idea of being able to whip up comfort food in just an hour — and having it taste like you’ve been working on it all day! 😉 Thanks for the tips about the burn warning, too! Your chili looks amazing. Love the textures and flavor combinations. The brown sugar is interesting too! I gave never put that in a chili. I love those cooking light magazines have a few of those on the book shelf. Great recipe! Yum! I’m super digging your pics of this chili too! And sounds so good! Thanks so much for sharing :). That burn notice is so annoying — thanks for all the great tips to avoid it. I remember panicking the first time I saw it pop up on mine, haha. Deglaze deglaze deglaze! !